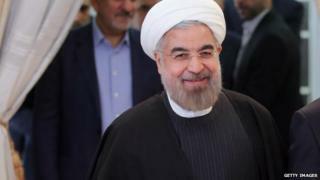 A tweet from an account believed to be that of Iran's President Hassan Rouhani has triggered a big response in the Arab world. Why? Because he used the term "Persian Gulf". The Gulf. The Persian Gulf. The Arabian Gulf. What's in a name? A lot, if social media is anything to go by. These are all terms used to describe the body of water between Iran and the Arabian peninsula. When a tweet went out on Saturday from an account believed to be that of the Iranian president saying he had arrived in the "#PersianGulf port of #Asaluyeh" it did not go unnoticed in the Arab world. "Arabian Gulf Mr President!" chided one. "It is still called ARABIAN GULF, Sir," tweeted another. Iranians were quick to respond, citing a UN panel of experts - which in 2006 concluded that the term "Persian Gulf" should be used, based on its long history in maps and written records. "The Persian Gulf is a very sensitive issue," says Niusha Boghrati editor-in-chief of Radio Farda, the Iran service of Radio Free Europe/Radio Liberty. "It's a matter of the utmost importance - a matter of national pride." In recent years, the dispute over the name has flared dozens of times online. For a period in 2012, Google Maps had no name on it at all - prompting Iranians to set up an online petition and Facebook page. Google Maps now says "Persian Gulf" and, in brackets on the side, "also known as the Arabian Gulf". Perhaps the biggest controversy was in 2004 when National Geographic added "Arabian Gulf" as an alternative name in its atlas. Iranian bloggers set up a "Google bomb" - whenever anyone searched the term "Arabian Gulf", a spoof error message would appear. The issue is clearly a live one - as recently as last week, a number of delegates from Arab countries reportedly walked out of a Nato meeting after the organisers used the term "Persian Gulf". "We prefer Arabian Gulf," says Abdelkhaleq Abdalla, professor of political science at UAE University who says it's the term used in textbooks - and common usage - right across the Arab world. The issue has become highly politicised, he says. "If Iran wants to call it Persian Gulf, so be it. But that should not limit us - we are flexible." The area is sometimes simply referred to as "the Gulf", including by the BBC. It's a neat-sounding compromise - but not one that's readily accepted by either side.